Ordered a local queen and bees from BeeKind in Sebastopol. When talking to the beekeeper, he said that people often say that their bees used to die for many years, but once they tried these local bees, they survive the winter. 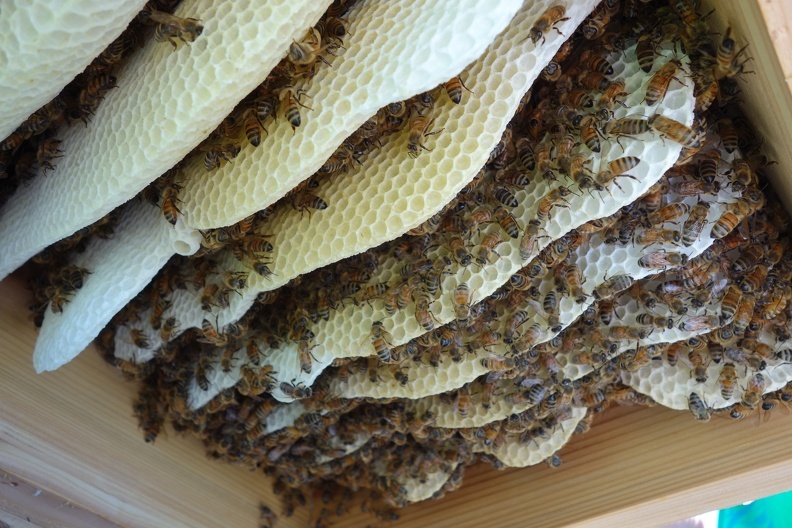 He also mentioned that the queens are from his local Warre hive that’s been doing great. 10/7: Noticed that the colony seemed to be decreasing in size. No harvest yet. 5 boxes total, top 3 seem full. No clear pollen being brought into the hive. No drones seen coming in either. 10/8: Planning to Harvest top box. Added bee escape board under top box. Did a mite check after adding some powdered sugar, though, and found that there’s lots of mites, but no deformed wings yet. EEK. Need to treat for Varroa asap. Ordered some “Mite Away Quick Strips”, should arrive next week. 10/9: Harvested top box, moved bee escape down one level. Small amounts of uncapped older cells seen in the bottom of the next box down. Added 1/2 cup of powdered sugar to the next box down (just under the bee escape board). 10/19: Only a few bees left in the box. 1-2 visible in window, but no robbing yet. Removed empty bottom box and added some pollen just below quilt. Ordered “Mite Away Quick Strips” (Formic Acid), but order was cancelled, so had to order again, and it’s still not here. Lots of varroa on bottom board- assume colony won’t make it :-(. Same bees as the previous years, and kept the hive in the same location, in the SE corner of the yard, 1 level up from the lowest garden level. Not sure why they died this year. Same bees as previous years. We had a huge mite infestation. Tried powdered sugar, but I think it was too late. Same bees as the previous year. Not sure why they died at the end of the summer. 5 gallons of honey harvest, though! Rob gave us our first hive! 2-3 Warre boxes. I think I bought an additional one with a window. He had bees in it already, so we just let them do their thing. They died in the late summer, and we harvested the honey.